Is anybody learning to play an instrument at the moment? I would love to hear about your experiences. 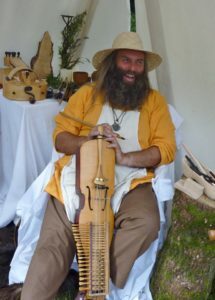 I was exploring the Loxwood Joust Festival last summer before a performance with the Mediaeval Baebes when I met a Scandinavian string instrument maker – Jeff Swann in the artisan and reenactment area. He showed me several of his beautiful instruments including a Hardanger fiddle but the Swedish nyckelharpa captured my attention. Its gentle tone just mesmerized me and I played for as long as I could before going on stage. The rest of the year became very busy with recording my debut album “With love…” and preparing for the US tour with the Baebes but this afternoon I am going to visit Jeff to borrow a nyckelharpa to see how I get on. I’m so excited! I’ll be posting updates of my progress and maybe some recordings soon so watch this space and please let me know about your instrument discoveries.